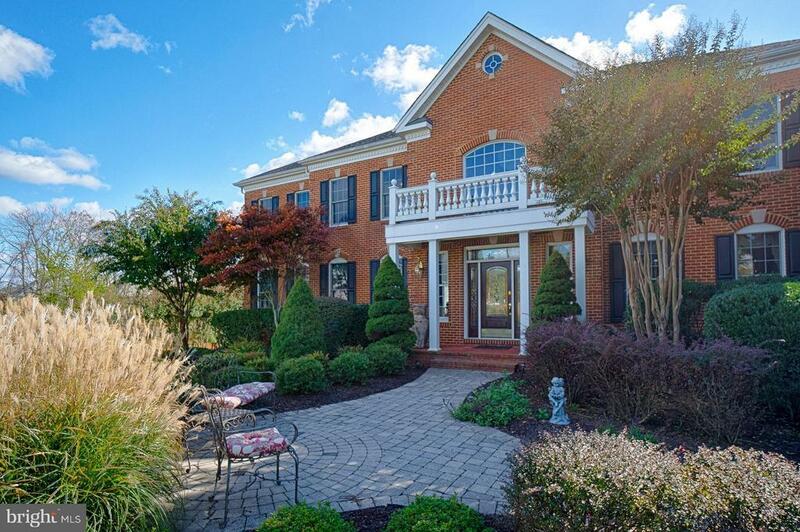 Popular Hampton Model on Private Estate in Dominion Valley Country Club. No need to wait to build! This private Home is located at end of a cul-de-sac and backs to trees and common area on 1.37 acres of privacy! The home boasts many new upgrades including NEW 5 plank Hardwood Floors. Custom draperies and paing. Grand Entrance with Marble Floors and an Elegant Double Staircase. This truly fabulous Chefs Kitchen includes Granite Counters, Stainless Steel Appliances, Huge Center island, eat in area and large Mud Room & Laundry. The Formal Living Room & Dining Room with custom paint, elegant chandeliers and a heavy trim package including chair and crown moldings. The Side Conservatory is wonderful for gatherings- shiny marble floors and windows galord! The main level Office includes the large built in cabinets. Tray & Coffered Ceilings throughout the home and also in the Family Room. Enjoy the Gas Fireplace and built in speakers. Off the Family rook is another multi purpose room; can be used as a Main Level Bedroom or office for school work! Upper level includes the wonderful Owners Suite w/the Luxury Bathroom & 3 Walk in Closets! Custom Built in provide lots of hanging space. The Master Bath inc. a large soaking tub, upgraded tile, double vanities and unique light fixtures. Each Bedroom has is own Private full Bathroom. Entire upper level is hardwood flooring. The lower level Rec Room is a great area for parties and fun! The Wet Bar allows the host use of the kitchenette- refrigerator, dishwasher and sinks. The second Fireplace is surrounded by the Stone wall feature and custom columns to add charm and warmth to the area. Pool table with custom lighting. The Media Room includes chairs, screen and projector. There is a large Guest Suite with a gorgeous Full Bath and huge shower. Plus an additional Game Room & A Steam Room! Walk Out to the Olympic size swimming pool - all freshly updated with brick pavers and concrete. Above is the huge Trex deck with stairs to the rear yard. Black Wrought Iron Fence surrounds the pool area. This home is not to miss- truly one of a kind! HOA fee includes the social membership. Directions: 66 to Route 15 N (exit 40) to Left on Dominion Valley Dr to Right on Waverly Farm Dr, Left on Bent Grass Dr (go thru security gate) Left on Jacobs Creek Pl to Right on Foleys Mill Pl.